Chief Cliff Volunteer Fire Department and Quick Response Unit members include, from left, Sigurd Jensen, Pres. ; Judy Cothern; Jim Edwards, Grantor; Marie Beck, Grantor; Rick Cothern, Director; Brendeon Schoening, Captain; Andy Learn, Chief. DAYTON — The Chief Cliff Volunteer Fire Department and QRU is the proud beneficiary of a grant in the amount of $4,321.85 from the Edwards Charitable Foundation. As a newly formed 501(c)3, ECF seeks to provide charitable dollars, primarily within the State of Montana, and sought grant applications from small non-profits earlier this year. At that time, the CCVFD/QRU submitted a request for the funds needed to equip their newly purchased (used) 4WD International pumper. Grantors James Edwards and Marie Beck met with key members of the department, toured the main fire hall, and soon after provided a check for the requested amount. 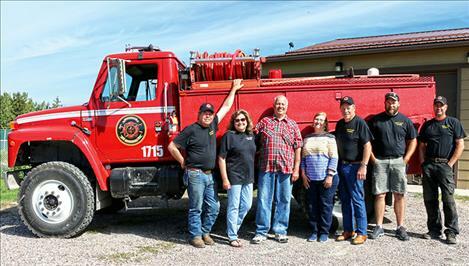 Once the truck was fully outfitted, the Chief Cliff VFD/QRU invited Edwards and Beck to view the results of their generosity, and both firefighters and grantors took part in a photo opportunity. It is generosity such as this, in addition to modest tax monies and an annual fundraiser (Dayton Daze), that enables this rural volunteer fire department and quick response unit to provide quality emergency services to the members of the Chief Cliff Fire Service Area and surrounding communities.